Horror scenes? Check. Vulgar language? Check. Sexual things? Check. Sexual innuendos? Check. Blood? Check? Violence? Check. Irrational actions? Check. Welcome to the world of movie horror fans, male teenagers, young male adults and their dates. 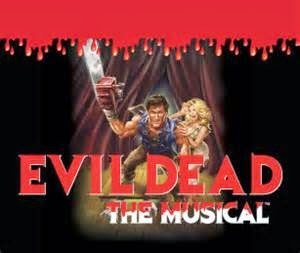 Evil Dead-The Musical is a take off, pure camp mixed with satire, of the Evil Dead movie franchise with a little Rocky Horror Show salute thrown in with the dance number Do the Necronomicon. The actors not only chew the scenery but swallow it and then spit it up in the form of blood. I am not a fan of the horror genre but I found myself laughing out loud at some really corny jokes and actions, hoping no one I knew saw me--it is that kind of show for older folks. The young ones sit in what is known as the splatter zone and love every bit of blood that gets on them. The lyrics by George Reinblatt, who also wrote the book, and music by Frank Cipolla, Christopher Bond, Melissa Morris and Reinblatt are more than you would expect and in some cases are enhanced by some excellent choreography by Stacey Renee Maroske with a couple of numbers stopping the show. Callie Johnson and Ryan McBride playing dual roles seem to be having as much fun as the audience. David Sajewich, in the lead role as Ash, sings, dances, acts, plays broad comedy, cuts off his hand, saws off his girlfriend’s head, handles a shotgun and gets into physical fights not only looks the role but makes everything seem like he does all this in real life naturally. Aiding and abetting the actors mentioned are Julie Baird, Demi Zaino, Creg Sclavi, Ryan Czerwonko, Jessica Kingsdale along with Andrew Di Rosa, as Jake, who almost steals the show with the song Good Old Reliable Jake. All you have to know is that 5 friends are going to a cabin for the weekend for fun and games and there is only one road going to and from the cabin and they are surrounded by woods. Oh yes there is the evil book, the Necronomicon. There were, obviously, many fans of the musical in addition to horror movies but even if you aren’t one of the latter don’t worry when and where you laugh because others will be laughing too.